I had a lesson with Cheryl today. I'd purposely given Rogo 4 days off as a little break, and he was very forward, which was nice. Cheryl's also been giving him oil lately (I didn't know until today), so I don't know which did it, or if it was both. Anyway he can't stay on the oil because Cheryl said his hocks swelled after he went on it and went down when she took him off it. I think it was corn oil (bad mama for not paying attention, I must check and make a note), so maybe another kind would work. We did some nice walk trot transitions - contact stayed good and he remained forward. Mental note to self though - I'm not used to him being so forward (which I want him to be), so the first couple of times he really bounced into a big trot from the first step I didn't go with him to the extent I should have and may have discouraged him a bit with my hands :( I could just kick myself for that, because I've been encouraging him to be more forward in his trot forever, and when he is, that's what he gets for thanks. It wasn't too bad though and I learned after the first couple of times. We worked on leg yield which is taking FOREVER. It's one step forward, two steps back. Every time we make a bit of progress it disappears again. I have to be doing something wrong. I got some good advice the last time I posted this and also Cheryl is watching and coaching, but we aren't getting it very well. Cheryl tells me I'm doing everything right except often holding with the inside rein a little too much. Rogo does an excellent turn on the forehand and it was very good even the first time I asked him, so he gets that. He's progressing nicely with shoulder in, so he understands the various aids, bending, etc. He's walking his leg yield okay most of the time, so maybe he'll have a break through soon in trotting it? We did a small amount of canter each way. 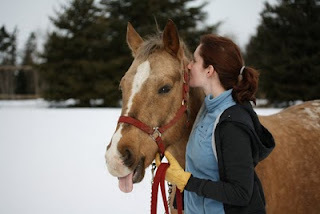 It was very cold and also his feet need a trim (the farrier is coming tomorrow), so we kept canter short. The canter was quite nice if I do say so myself - he had lots of jump and he went nicely round for me for much of it. I need to remember to keep my center of gravity upright (I tend to lean back a tad without realizing it), keep my legs long and heels down, and to keep my hips loose. He's such a sweetie pie. I'm really happy with him. Maria wrote the caption :) Jen tells me she lunged first and had a great ride, that he was uphill and fun throughout. She is doing such a great job with him. Sooo good for him to be groomed, ridden and loved on. haha, love that picture! Sounds like a good ride for the most part. It's always frustrating to have one thing not go right, but it will come. I've used corn oil a lot with no problems. I've heard of others using canola, maybe that would work? Oil will certainly help with the enerfy level. Sounds like a great ride Carol. You're doing so wonderfully with Rogo - I love hearing about your work with him. Is the oil to increase energy level or keep weight on? I know so little about nutrition - oil is good for this? Good to know. It sounds like you guys are doing great. My impression was 90% is going well and 10% is a challenge. Sounds like a good ratio to me! I have to be careful with my hands too. A little alfalfa (hay or pellets) is good for weight and energy too. Your blog is another that I adore reading, keep up with the good work! I think you and Rogo are doing great together. It takes a long time and little steps to get it just right. Love that picture and the caption. Really cute. That picture of Dan is priceless. You should print it, and give to Jen as a gift. I give Rosie Flax seed oil, I've never noticed swelling though. Sounds awesome Carol! Forward is so so good, especially if you've been tentatively chasing it for a while. Well done!! !